Place your x-y table under it and start blasting away! We are so confident of the price and performance of our Beam Delivery device that we encourage you to check out other manufacturers' beam delivery device before making your decision !! 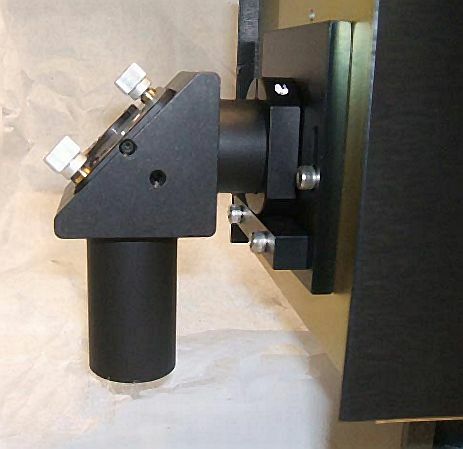 shown with high pressure nozzle assembly; $2,375. without the nozzle assembly; $1,995. Shown mounted to a PLX-S co2 system. 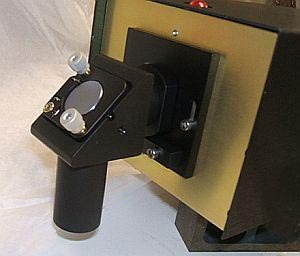 Beam delivery device shown attached to PLX25-S.
Standard Output lens : 1 inch diameter, 4.0" inch focal length Plano-convex AR coated ZnSe, mounted in a Lens Holder tube for attachment to BD-1 and quick lens replacment. Shorter or longer focal length lenses -- 1.5, 2, 3, 5, 7.5 and 10 inches -- for applications that require them, are available on request (you get longer Depth of Field). For a quick discussion of 'beam waist', 'depth of field' and other relevant definitions please see our FAQ page.